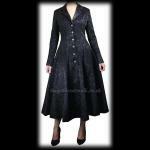 A stunning gothic jacket made from very lightweight black satin with a red satin back and side panels. 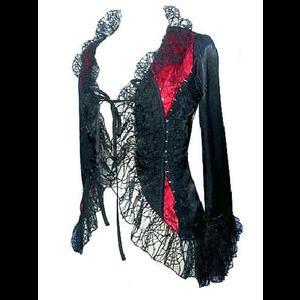 The red satin is covered with very soft black cobweb lace. These side panels have a series of hooks and eyes with lace edging and can be adjusted to give a custom fit. 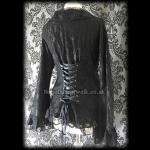 The back of the jacket has a small corset laced adjustable panel. 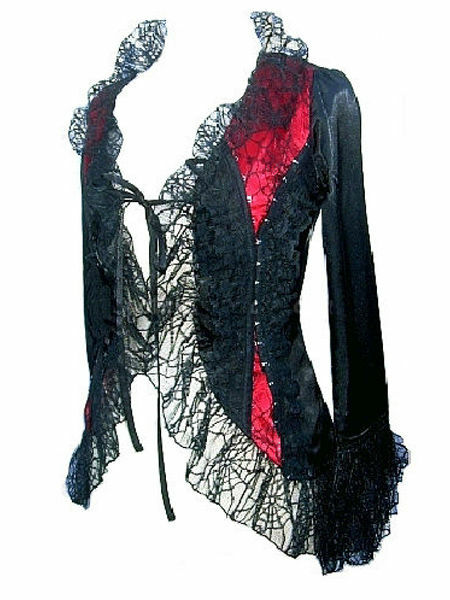 The sleeves are edged with double frilled wide cobweb lace and single cobweb lace finishes the hem, the front and the entire neckline front and back. 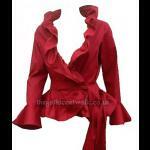 Fastens with a satin tie at the front. Length at back from top of neckline: 33"
Length at back from top of neckline: 35"